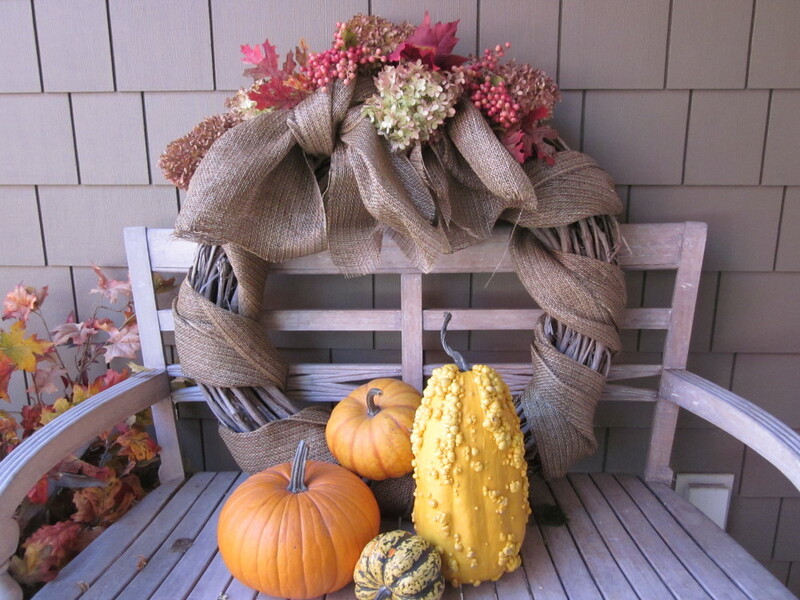 I wrapped a large twig wreath with 12″ wide burlap strips, twisting and turning as I wrapped it around the wreath, leaving tails long enough to tie in a large knot at the top. 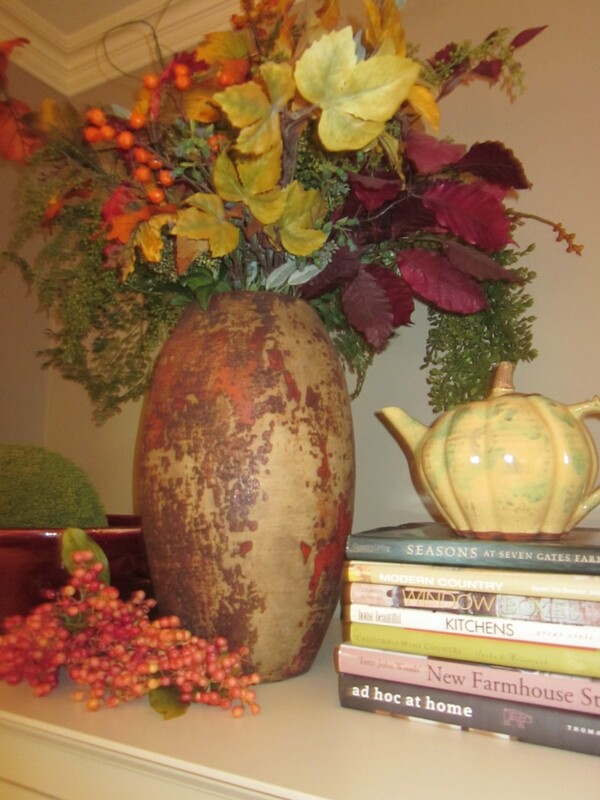 I tucked a few of my dried hydrangea blossoms and sprigs of artificial fall foliage in and around the knot for a bit of color. Propping it against the back of the bench rather than hanging it above the bench, gave it just a slightly different presentation. It’s always fun to showcase something in an unexpected way. 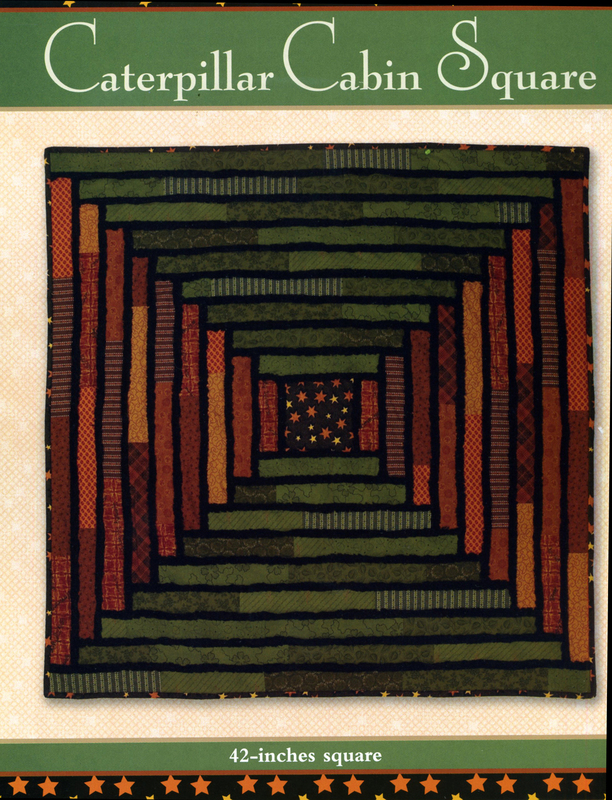 In Thimbleberries Small Wonders book by Lynette Jensen, you’ll find a collection of 44 quilting inspirations. 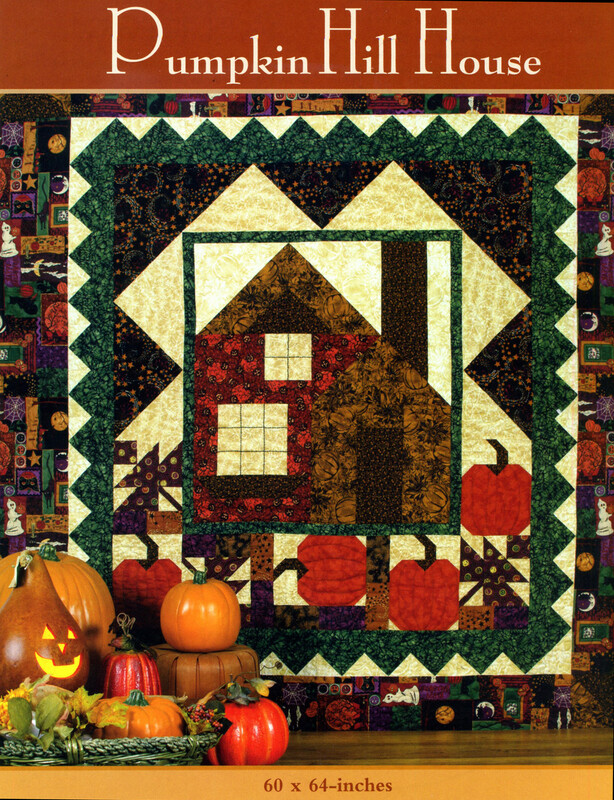 Here’s a sampling of some fall projects from the book. Order it from Laudauer Publishing today! Pumpkin Boy artwork with picture of baby Taylor in his giraffe Halloween costume . 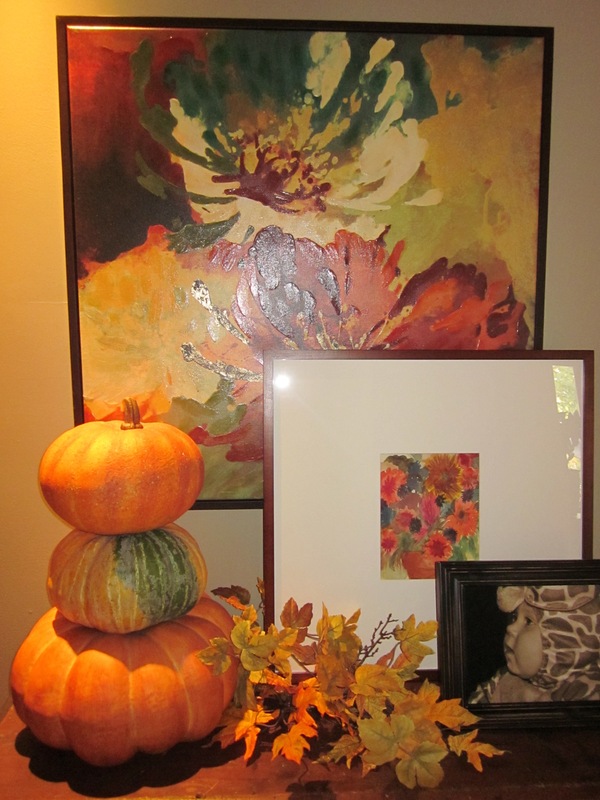 Stacked pumpkin display with picture of baby Ella in same giraffe costume 3 years later. 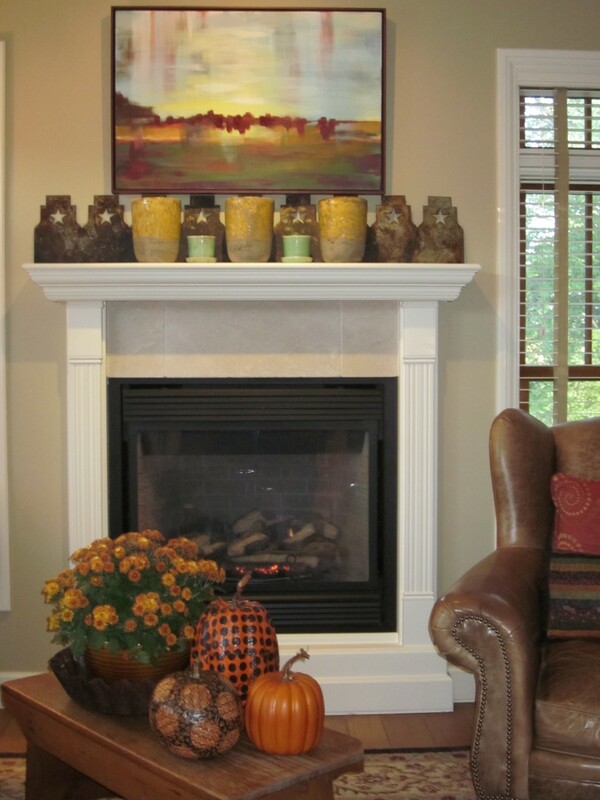 Sitting room fireplace with abstract artwork by Lynette grouped with an antique metal star stencil and pottery. Dining room side board arrangement. 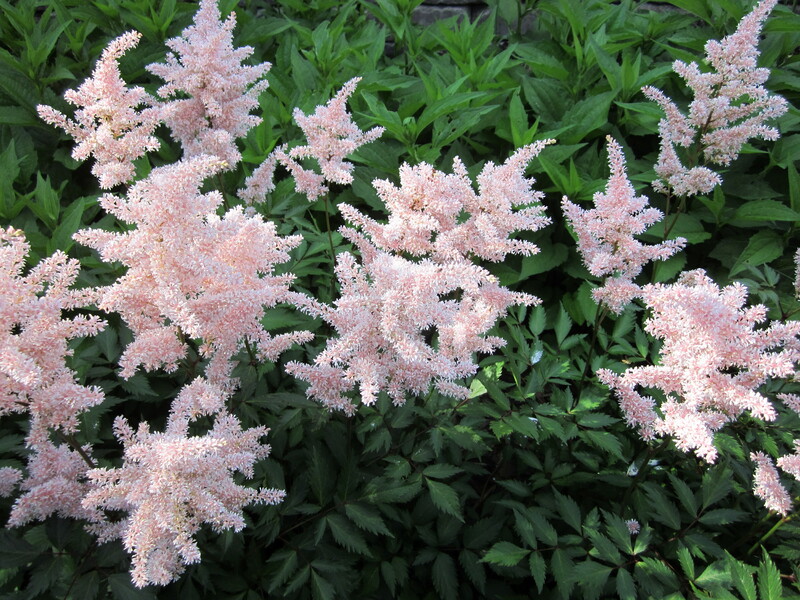 Just a few moments that caught my eye this summer…. 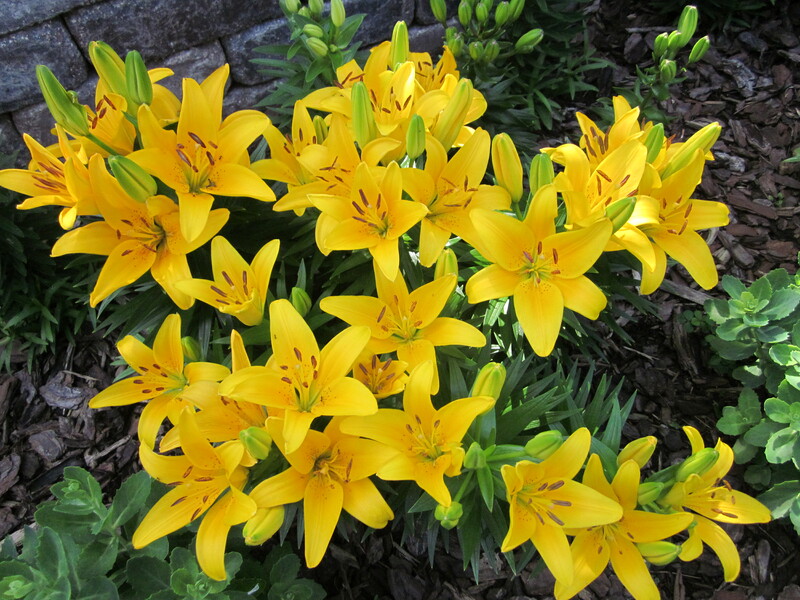 Pics from top to bottom….Asiatic Lilies, Front courtyard garden, Astilbe, Potted Coleus with Asparagus Fern and Neeto, Lake Superior off Grand Marais, MN, Backyard garden shed, Side patio by my grill, Bird bath reflecting pergola on a still morning and Tent for Ella and Taylor. When it was time to give Ella her big girl bed in her own room at my house, some room shifting took place. Taylor moved into his new space and Ella took over what was once Taylor’s room when he was a baby. First thought…must the paint color change or could it work for her as well? I made the decision to choose items that would work with the existing paint job. 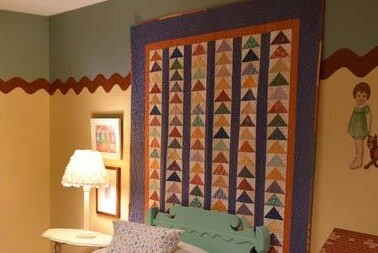 The giant rick rack border and two toned walls were just too cute to bid farewell. So the challenge was to “girl it up” without going down the usual pink path. Except for the bed and the child-size slipper chair, all other items were in the house somewhere and just needed to be brought together. Hanging a colorful quilt was probably the most important unifying element. 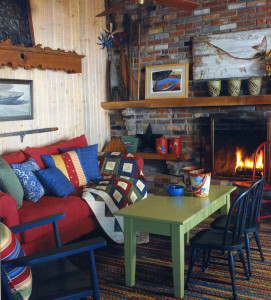 It had so many colors in it that coordinated with the wall colors and gave the room a bright, cheerful vibe. The large blackboard (achieved with blackboard paint and molding) needed a touch to make it more feminine. 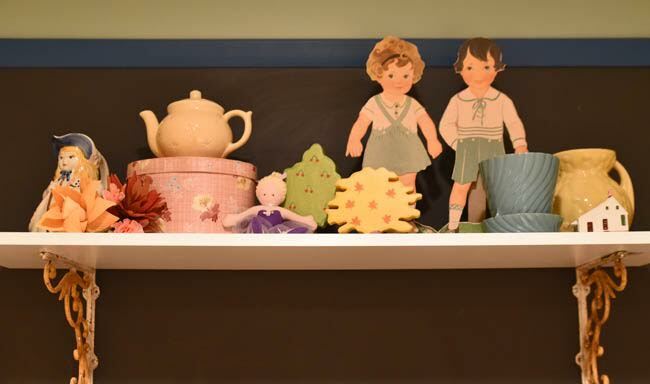 A small shelf with fun brackets lent itself nicely for housing teapots, flowers, a small ballerina, etc. It was safe to assume it would be a long time before she would need blackboard space that high for her chalk artwork. Since she is still too small for drawing pictures, the chalk shelf is used for book display. It’s so much easier for her to select books when she can see the covers rather than just the spine of the book. 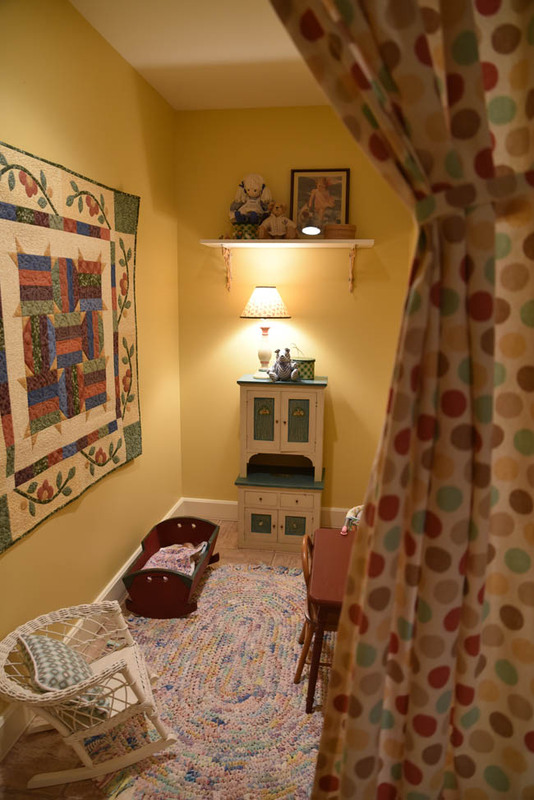 The little slipper chair (not shown) was slip covered in the same fabric as was used for a curtain doorway that leads into a little nook in the room that makes a perfect playhouse and houses an antique child’s cupboard. 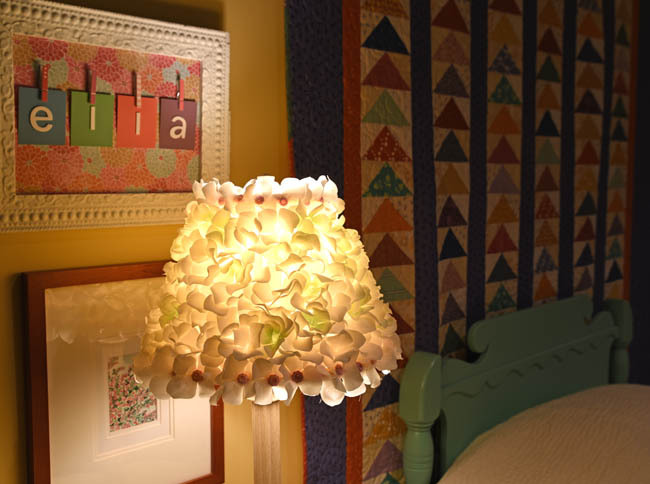 Many items used in Ella’s room were once in Kerry’s room when she was a little girl. 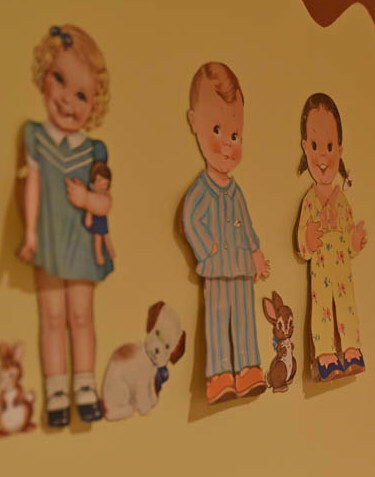 Handmade artwork hangs throughout the room, including favorite, oversized paper dolls from the forties. I loved playing with paper dolls as a child and collected these little charmers over the years. Thank goodness they finally found their way out of storage to adorn the wall above the dollhouse from about the same era. Ella loves her room and is very proud of it and likes to keep it pretty. She was a little put out when she first walked into the room and immediately noticed a Star War’s light saber casually left on the floor by her brother. She promptly put it outside her bedroom door. DIY project… I made the “Ella” name sign using paint chips from the hardware store, adhesive letters from Target craft department, mini close pins from Joann Fabrics, a piece of scrap booking paper, an old frame that I spray painted white, and a little glue. I am one of those people who is very influenced by the seasons of the year. Perhaps growing up and living my entire life in a part of the country that has very definite climate changes is the reason. I genuinely enjoy each season and look forward to the changes. The landscape is ever changing, entertaining takes on new emphasis, activity in the kitchen is dramatically different, family gatherings have new meaning, and of course, home decorating is inspired by the seasons. 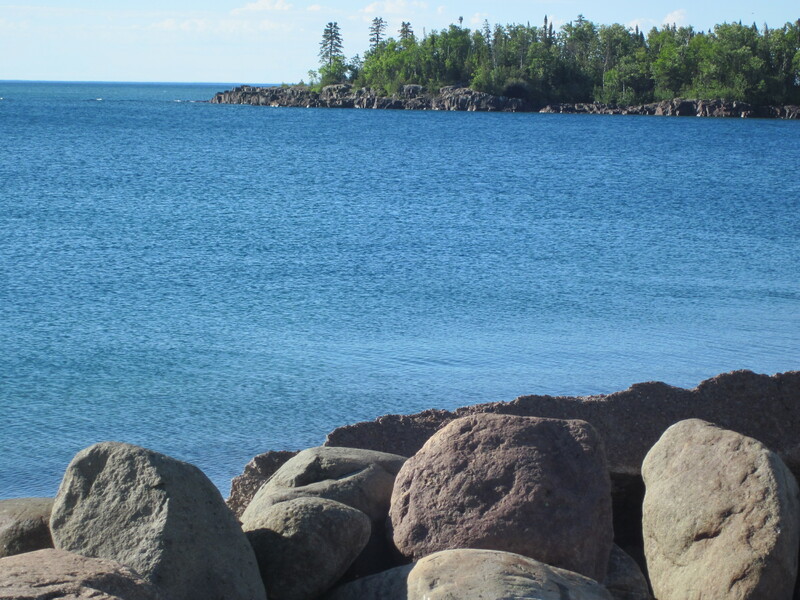 Since we are in the middle of a delightful summer here, we are reminded of why we love living in Minnesota. 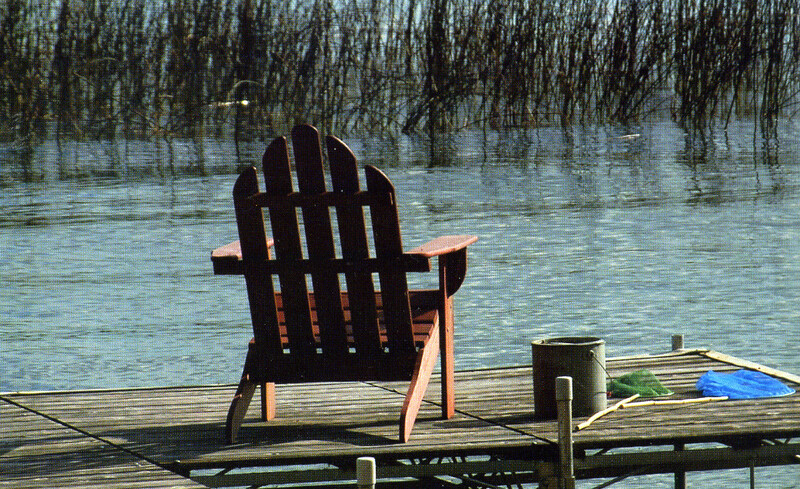 Our attention as a family turns to spending time at our lake cabin nearby. 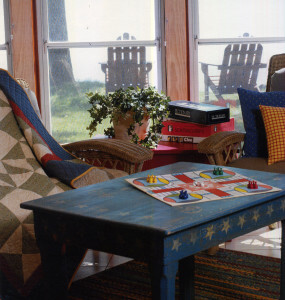 From my earliest childhood through present, my fondest memories are of time spent with family and friends at “the cabin.” I grew up going to the cabin at Lake Minnie Belle. To continue the tradition, my husband Neil and I purchased the cabin, many years ago, from my parents so our children have been raised going to the same cabin. 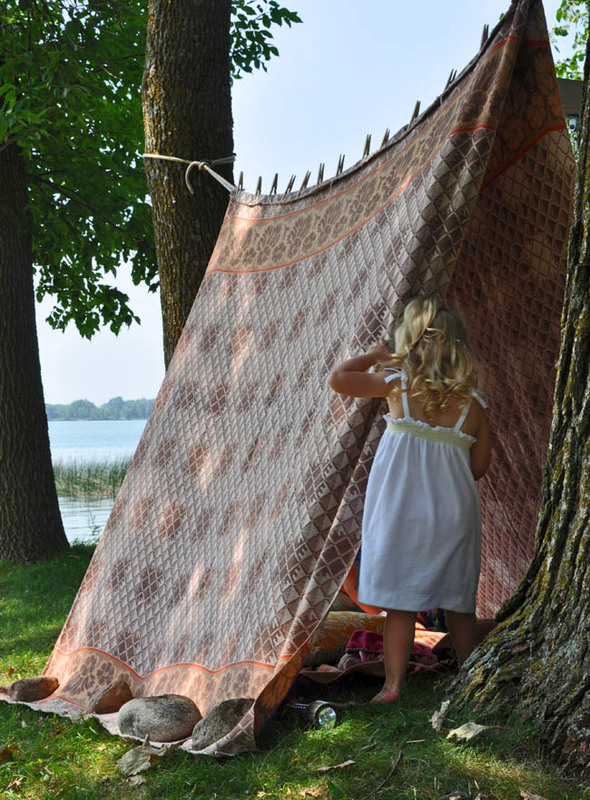 We are now into the fourth generation enjoying the same spot and the same activities. Our grandchildren, Taylor and Ella are following in everyone’s footsteps; literally, on the same yard and on the same dock. It is a lovely tradition that is being carried on every weekend from Memorial Day to Labor Day. Needless to say, the cabin has given me another canvas for decorating purposes. 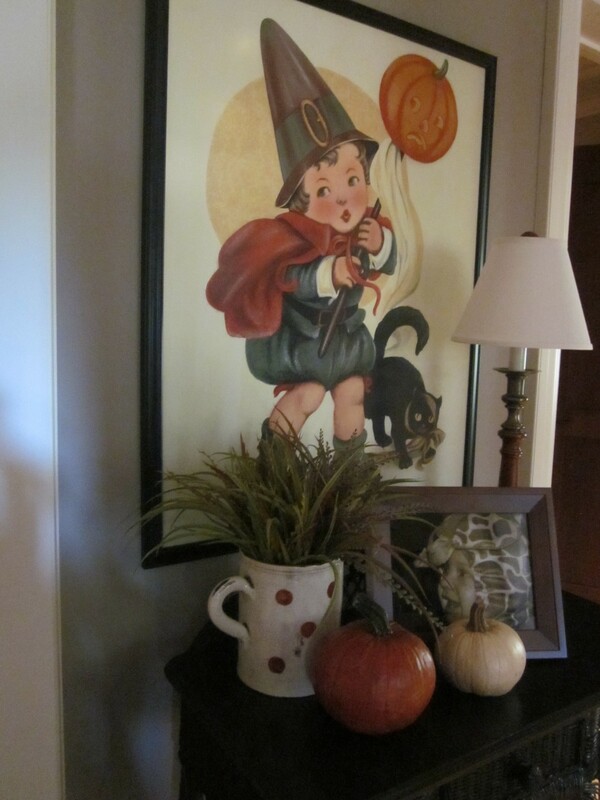 It is most fun to display and live with vintage pieces. 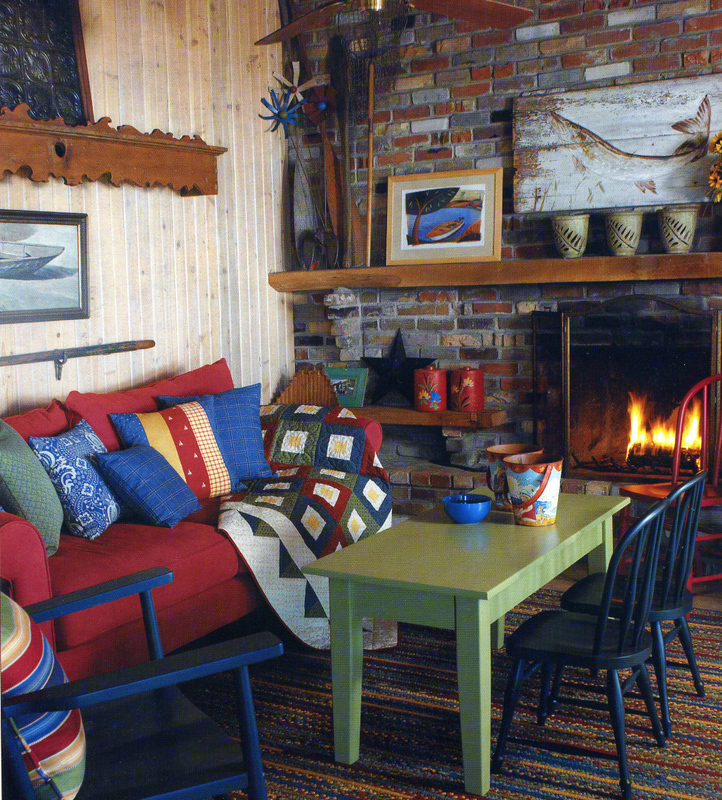 It isn’t a… lake home, but rather a lake cabin…they are two very different things. It is still fun to add accessories and move things around a bit now and then.It has always been important to keep it casual and easy. Wet feet and bathing suits are always welcome. 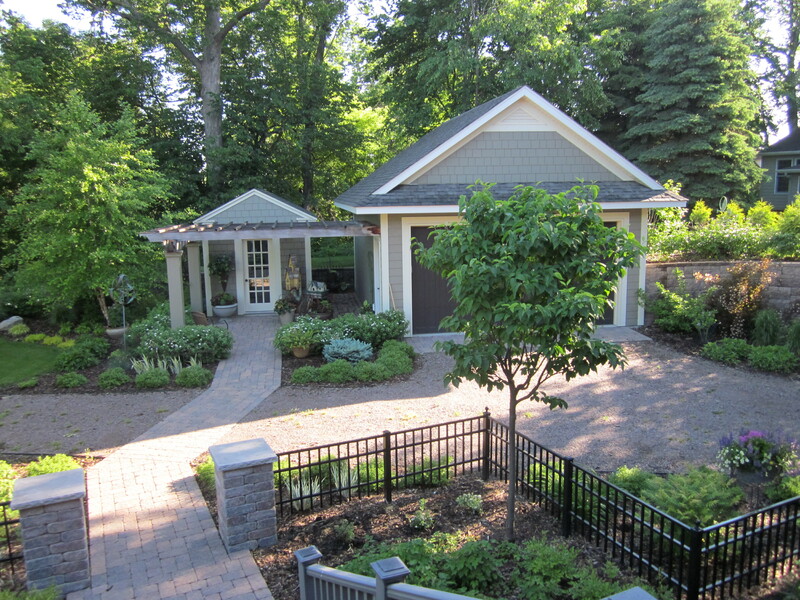 Here is the cabin as it is today…a welcoming summer retreat for all. 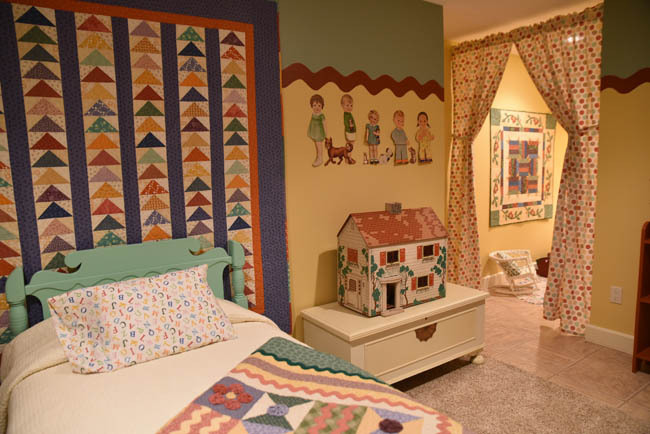 Photos and quilts shown below, Block Party and Holly Goose Chase, are featured in the book, New Collection of Classic Quilts by Lynette Jensen from Landauer Corporation. They are two of many we have at the cabin. 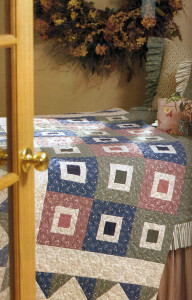 The red, white and blue version of Block Party is used at the cabin, Holly Goose Chase without the holly appliqué is one of the beds. 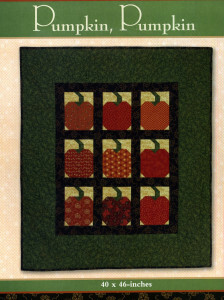 I have your “pumpkin patch table runner & wall quilt” pattern from 2002. Love it, made both and also substituted a Christmas tree for the holiday. 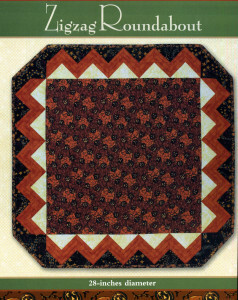 What is the name of the star you used in the pattern? Haven’t been able to locate it without “something” in the corners. I don’t have a copy of that pattern any longer so can’t help you specially. However, can’t you just eliminate what you don’t like from the star block? Mine was not a published pattern but rather a Thimbleberries Club exclusive long, long ago. I would love to make the Kaledioscope burst table runner. Is the pattern available? 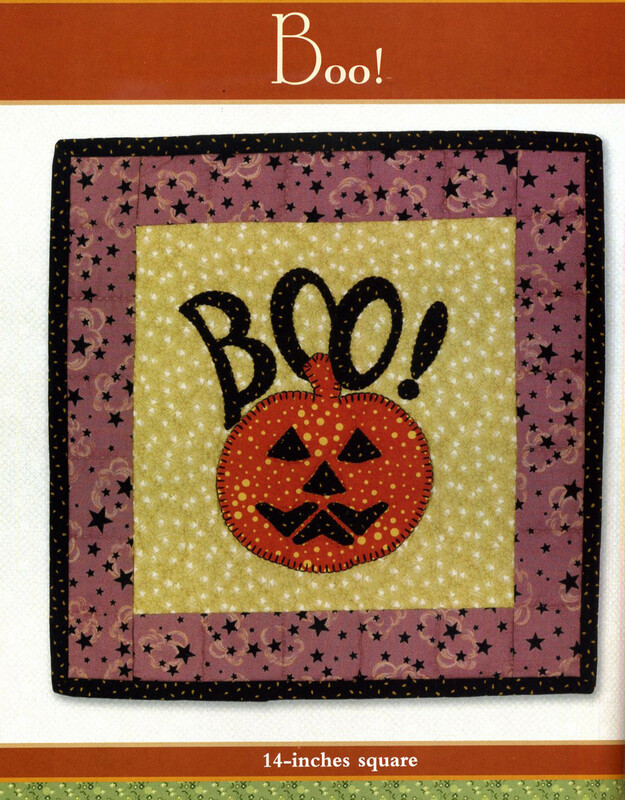 The pattern is available only in the kit sold by Fons and Porter. It was part of the Thimbleberries Project of the Month a few years ago. Occasionally I have run shirt of a fabric & found it on websites for obsolete fabrics as well as Amazon, EBay, & Etsy. Also, Baron’s Fabrics in Camarillo, CA & Woodland Hills, CA had quite a stick if Thimbleberries panels. Hi Lyn, I purchased the lodge big quilt 2008. I am making it now 2017. I have all the books (6) and the fabrics. The problem is is the center square. I can not find it at all. Could you email or message it to me? The center block was a pre-printed fabric block and perhaps will be impossible to find now so many years later than produced. 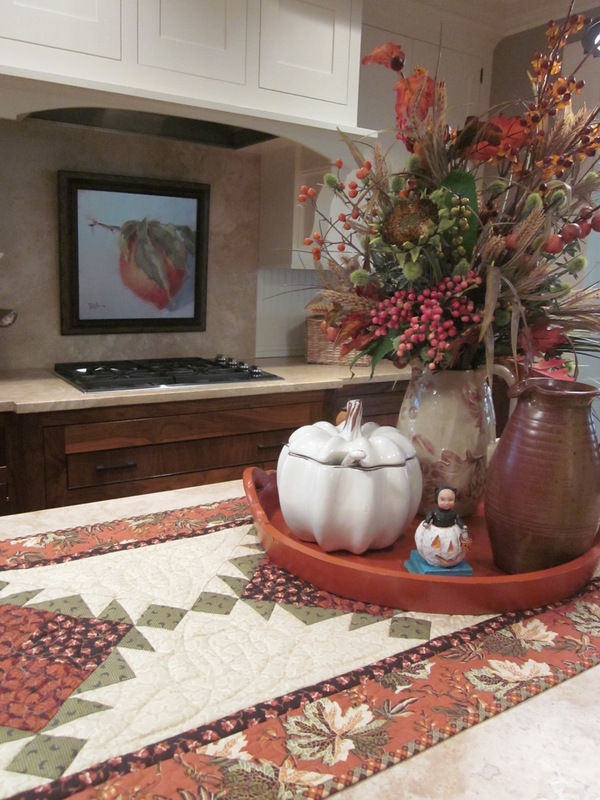 You will perhaps have to improvise a design for that area or just find a fabric that will look good in that spot. 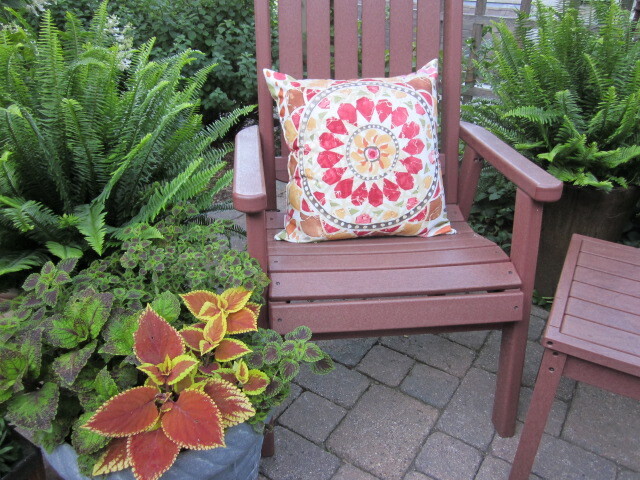 A muted background print or solid with interesting quilting would be very nice. Or you could strip piece scraps from all the other blocks for that space and if you like to applique, the possibilities are endless. It is always difficult to help out on these requests so long after the fabric has been out of print or circulation. Many years ago when I was first learning the basics of quilting, I joined the Thimbleberries Block of the Month group at a local quilt shop. For several years I collected the monthly projects in a 3-ring binder and still love to browse through it all these many years later. Your patterns gave me confidence to use a rotary blade, sew half square triangles and choose fabrics for my projects! I am so glad that although I was on a tight budget in those days, I was able to collect many of your books. I just love your vintage styles for Halloween and Christmas and have started my own collections from your inspiration! Glad to see you are still out there in the quilt world! Looking forward to whatever you have next on your agenda to share with us! Thank you for taking the time to write such a lovely note. 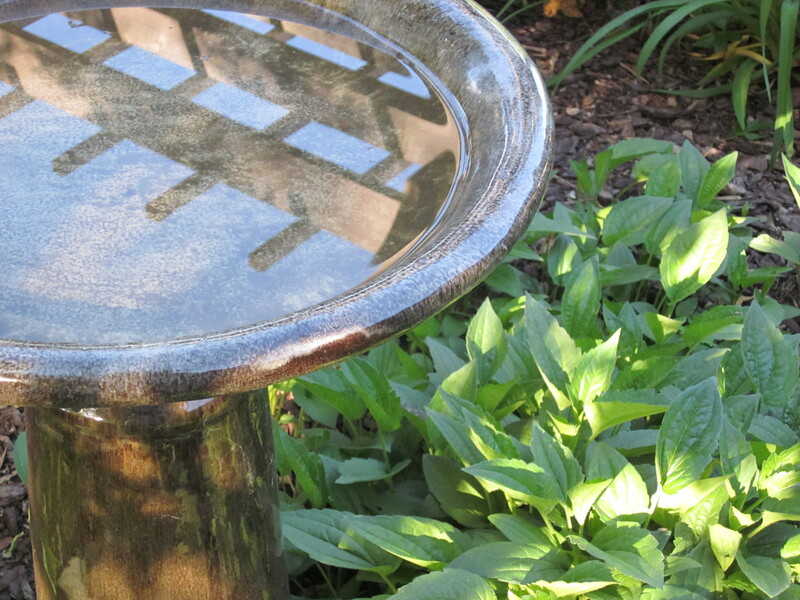 I certainly have enjoyed every moment of what I do that has come to define my design choices, both in my professional life and my personal life. Let’s hope we can all continue to do what makes us happy. Please log in your information in the top right hand corner of the Berry Blog to register for notification of new blogs. I think that works best. 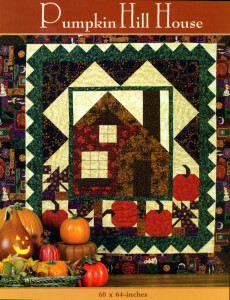 I Love your Fabric and books is it still possible to get some of fall patterns? Many publications are still available from http://www.landauerpub.com. If you go to their website I think you will find many publications you might like to add to your quilting library. It is a beautiful fabric collection. I have been working with it for a quilt for the new book. 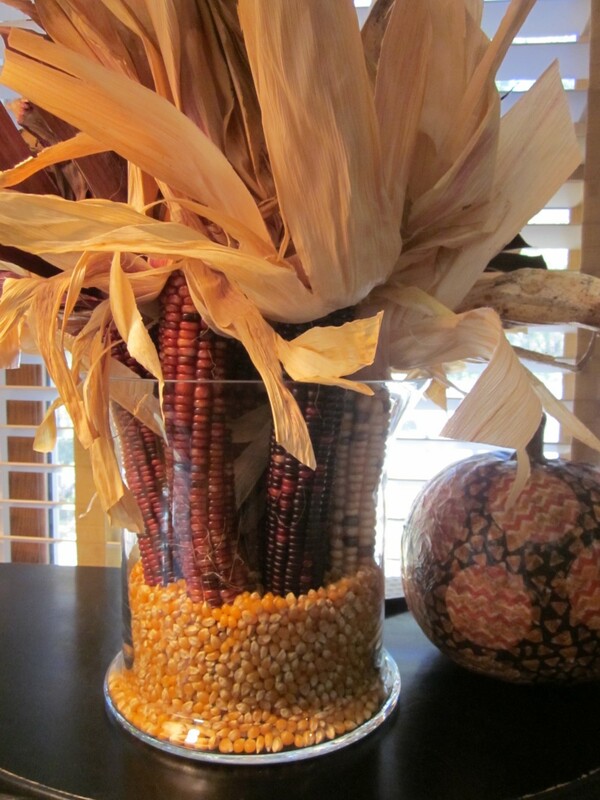 All the colors seem to just fall into place with the four large focal pieces. 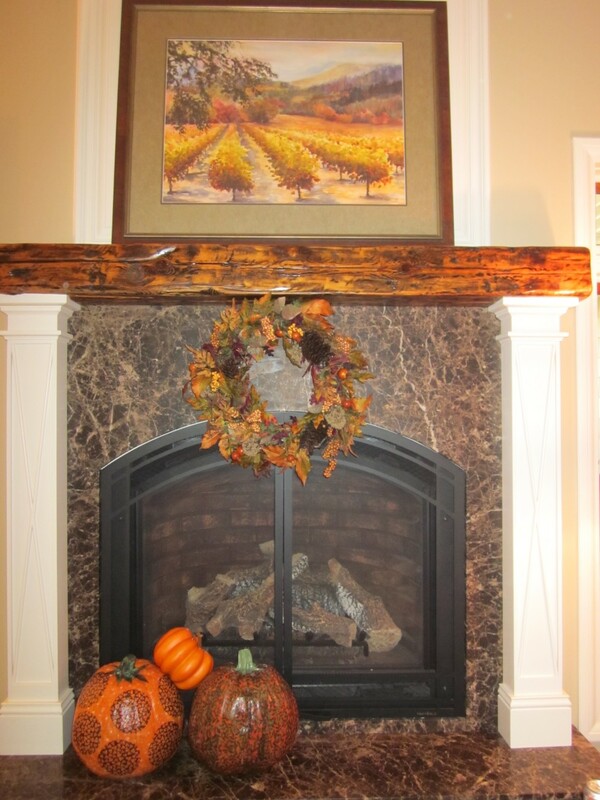 I love fall, so those colors are always fun to work with and go with so many of my things. Enjoy. I’m so happy to see you’re back with your many fans again. I was worried about you because I couldn’t understand why you suddenly stopped,especially being on top of your game. I worried it was for health reasons. When I saw the Block of the month quilt with so many bright and happy colors I knew you were in a happy place in your life. I have almost everyone of your books. My sister gave them to me each Christmas. So glad to have you out of retirement. I have been involved with the Thimbleberries block of the month clubs and all things Thimbleberries since 1994, and I was really sad to see you retire. You are such an inspiration to the quilting world. Welcome home! In trying to look up the recipes from the Happy Birthday Pat email, I found I was unable to download the recipes and there was an error message on your website. When I clicked on the recipes from the name, picture, or in the blog I would end up back at your main page and it would have Error 402 or something like that at the top. I don’t know if others are having the same problem, but it seams to be a website problem. Wanted to give you a heads up on this. Thank you again for all your beautiful fabrics, inspiration & patterns and quilts. I also love your decorating ideas. Thanks Grace…we will look into it. What a wonderful surprise to find your website! I started collecting Thimbleberries fabrics long ago from the (now closed) quilt shop in Cannon Falls. I was a beginner and you came and showed your beautiful quilts and I was hooked! So happy to see you again. Enjoy your life at the slowest pace possible. Cheers! I am so glad you have come out of retirement. I cannot tell you how I miss the camaraderie of my Thimbleberries Club group. We were all so sad for it to end. I don’t know if you plan to design fabrics only, or quilts as well. I will say, that either or both, it is such a pleasure to have you back. Thank you for all the wonderful years of quilting and decorating tips. 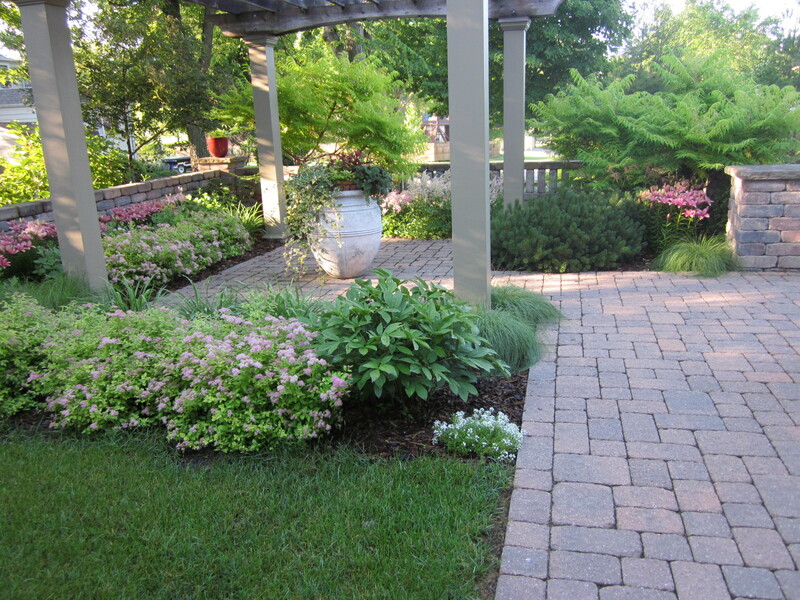 My home is truly spectacular because of your tips and inspirations. I even made the “double stars” quilt with the nine patch start and friendship stars in black and gold with a deep red border. I never saw it in any of our pattern books, but was featured on the back of you black and white checked sofa. Everyone wants to know where I got it when they walk into my bedroom in the winter months. I tell them, Thimbleberries of course!!! Welcome back Lynette, you have been dearly missed. Your grandchildren are just beautiful!!! My aunt has long been a Timbleberries fan. She is a master quilter. 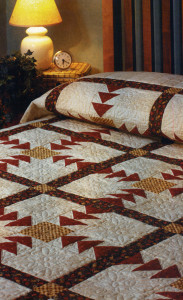 She gave me one of her quilts that is Timbleberries fabrics that I cherish. She taught and encouraged my mother in quilting in her retirement and has done the same for me. 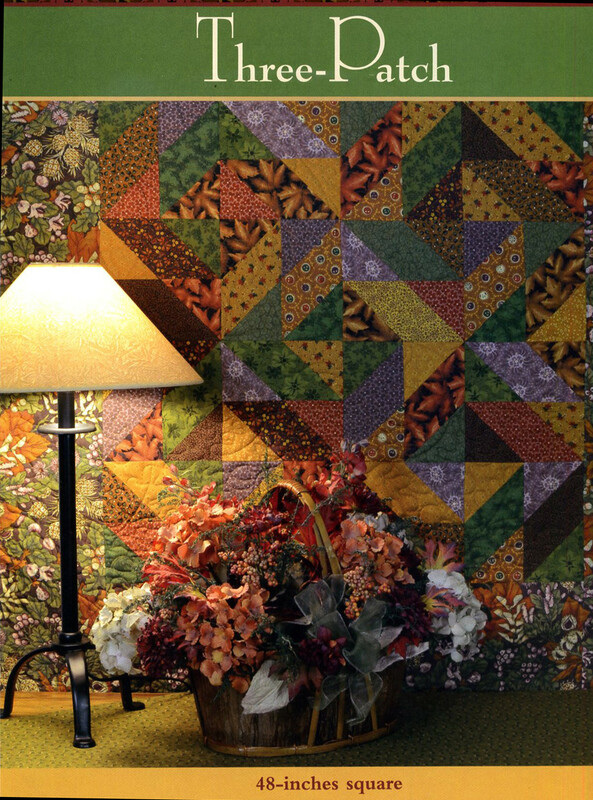 What a wonderful heritage as their mother and probably grandmother were also quilters as well. She is coming to visit in a few weeks and will help me sandwich my last quilt that she marked for me years ago. Prayerfully the markings are still visible! I have loved your Little Quilt books. I just love everything about Thimbleberries! Looking forward to seeing new patterns and fabrics. What a joy to see “Thimbleberries” pop up again! Welcome back! Looking forward to your new fabric! Glad to have you back! How do we get added to your blog?